An explosion detected on April 23 by NASA's Swift satellite was more than 13 billion light-years from Earth, representing an event that occurred 630 million years after the Big Bang, when the Universe was only four percent of its current age of 13.7 billion years. 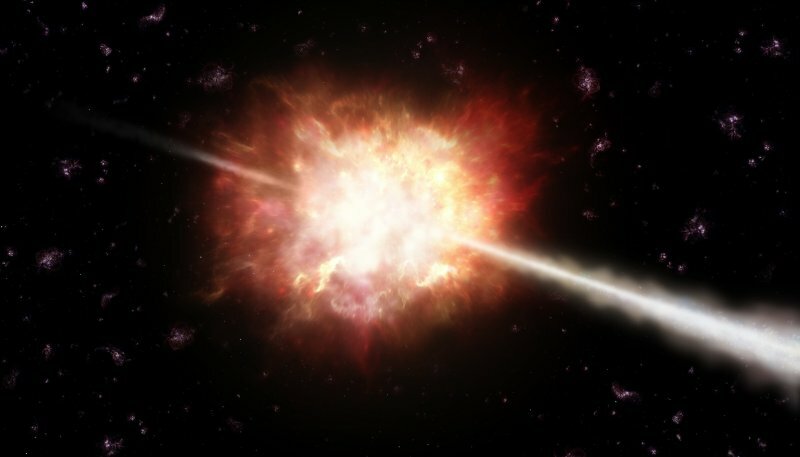 Astronomers turned telescopes from around the world to study the blast, dubbed GRB 090423. National Science Foundation's Very Large Array (VLA) first looked for the object the day after the discovery, detected the first radio waves from the blast a week later, then recorded changes in the object until it faded from view more than two months later. The scientists concluded that the explosion was more energetic than most GRBs, was a nearly-spherical blast, and that it expanded into a tenuous and relatively uniform gaseous medium surrounding the star. Astronomers suspect that the very first stars in the Universe were very different -- brighter, hotter, and more massive -- from those that formed later. They hope to find evidence for these giants by observing objects as distant as GRB 090423 or more distant. "This explosion provides an unprecedented look at an era when the Universe was very young and also was undergoing drastic changes. The primal cosmic darkness was being pierced by the light of the first stars and the first galaxies were beginning to form. The star that exploded in this event was a member of one of these earliest generations of stars," said Dale Frail of the National Radio Astronomy Observatory. "The best way to distinguish these distant, early-generation stars is by studying their explosive deaths, as supernovae or Gamma Ray Bursts," said Poonam Chandra, of the Royal Military College of Canada, and leader of the research team. While the data on GRB 090423 don't indicate that it resulted from the death of such a monster star, new astronomical tools are coming that may reveal them. "The Atacama Large Millimeter/submillimeter Array (ALMA), will allow us to pick out these very-distant GRBs more easily so we can target them for intense followup observations. The Expanded Very Large Array, with much greater sensitivity than the current VLA, will let us follow these blasts much longer and learn much more about their energies and environments. We'll be able to look back even further in time," Frail said. Both ALMA and the EVLA are scheduled for completion in 2012.